While heat and humidity are not my cup of tea, the warm weather and long days of summer mark prime growing season for locally sourced southern crops. So, what better time to spend a week touring family-owned farms that provide Southeastern Grocers (BI-LO, Harveys and Winn-Dixie) with fresh, locally sourced produce at prime ripeness. To add to the excitement, award-winning chef Curtis Stone – a longtime advocate for locally sourced, in-season produce – accompanied the group, along with produce associates from around the company, to learn more about the art of growing produce. 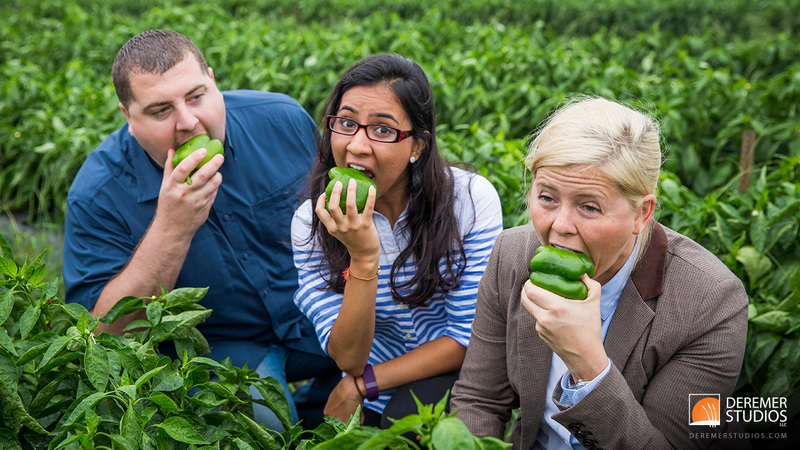 From a squash and zucchini farm in the foothills of South Carolina, to pepper and cucumber farms and a peach orchard in central Georgia – we had a grand time photographing this unique tour for the good folks of Southeastern Grocers! Despite the sweltering summer heat, it was a true pleasure to spend the week with the fine men and women who work so hard to bring fresh fruits and vegetables to our tables. It was immensely informative and a grand ol’ time. Of course, having a Corvette for the week courtesy of Avis didn’t hurt either… But more on that soon! As always, please feel free to download as many photos as you like! If you enjoy our photos, please follow us – and for extra bonus points, share this blog with your friends to help us get the word out! Interested in our commercial and event photography services? Visit our commercial photography page for details. Deremer Studios has a long history of providing our commercial clients with premium photography services, specialized equipment, and friendly, responsive service, all at an affordable price. This entry was posted in Commercial Photography, Culinary Photography and tagged commercial, culinary, curtis stone, Deremer Studios, event, Jacksonville, locally sourced, Photography, photos, produce, southeastern grocers, vegetables.